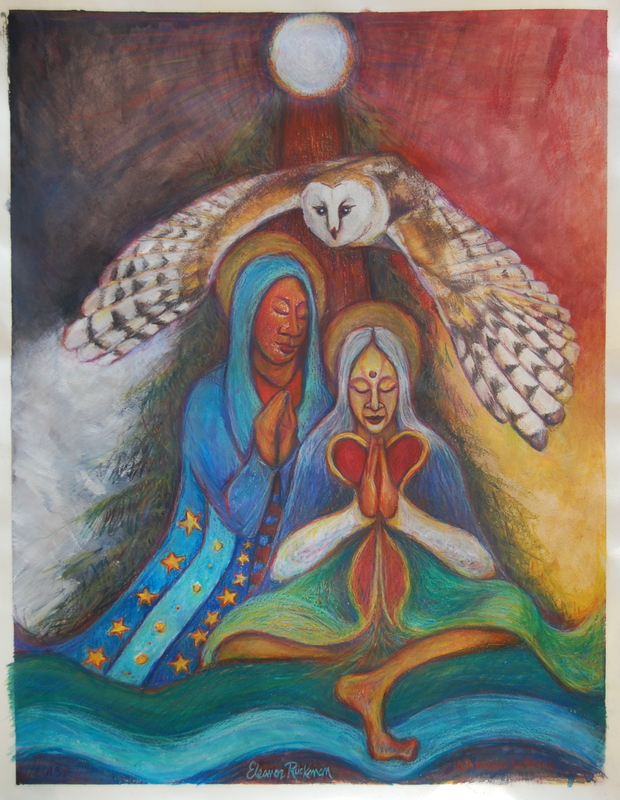 The beginning of this image came in a dream, when the barn owl’s face blended with the wise expression of Kwan Yin. Then I went to the redwoods in the Santa Cruz mountains, to pray and be in a sweat lodge ceremony with the Medicine Path circle, led by George Bertlestein. A few days later I danced like a dervish at Ecstatic Dance Oakland, and the image came whole into my mind’s eye. I stayed up late that night, sketching, and worked on this piece for close to nine months afterward. Materials include gouache, water soluble pencils and crayons, sumac, and turmeric.